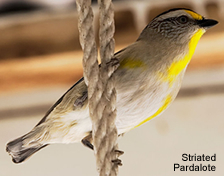 Pardalotes are tiny, brightly colored birds native to Australia. Their name is derived from the Gree word meaning "spotted." They usually occur in pairs or small family groups. After breeding, they are also seen in mixed feeding flocks. They nest in deep horizontal tunnels drilled into banks of earth. Externally about the size of a mouse-hole, these can be very deep, a metre or more. Pardalotes spend most of their time high in the outer foliage of trees, feeding on insects, spiders, and above all lerps (a type of sap sucking insect).